The ProHT Ergonomic Height Adjustable Sit-Stand Desk features an adjustable top surface that can be tilted at an angle for podium use, or set flat for mobile desk use, perfect for classrooms, offices, homes, showrooms, and more. Allows you to raise and lower your work surface quickly and effortlessly to healthy sit-stand heights so you can work with more comfort and relax your eyes and neck during working. Height Adjustable .Rotary knob lock ensures securely positioning of different height settings. Manual lifting height adjustment allows easy transition from sitting to standing and promotes the most ergonomic, comfortable working posture and standing position. With 4 platforms to store monitor, laptop, keyboard, printer, CPU, PC tower and speakers, provides ample room for typing, writing, and storing, and the working side comes with a mounted metal lip that holds items when tilted. Use with or without a monitor stand for an ergonomic layout. With 4 flexible 1.5 inch furniture casters, it is easy to move the desk from room to room ,the bottom wheels are designed with locking to make your cart stationary or mobile when desired. Easy assembly. All necessary hardware and installation instructions are provided for assembly. CARB Certified. ProHT Sit-Stand desks meet the CARB standard and own the CARB Certification. Compare to the other poor quality desks without CARB, the ProHT Sit-Stand desk is made to be the highest quality and will be more friendly to the environment, protecting you from exposure to toxic air contaminants, ensure to provide a healthy life for you and your family! Durable. Made of sturdy steel materials, sturdy base keeps steady mobility and prevents rollover.E1 grade particle board panel features heavy-duty and moisture resistant. Max Load Capacity up to 88lbs. Ergonomic Design. Height adjustable from sitting to standing. 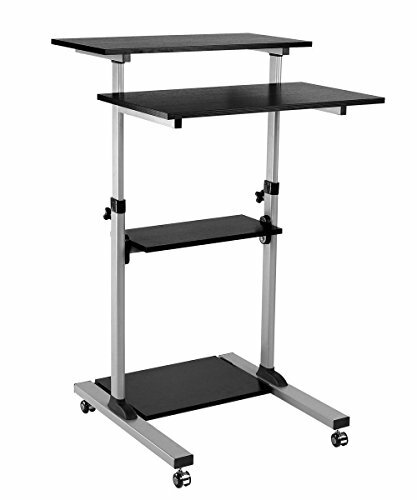 Ideal for use as a stand-up portable computer office desk and can also be used as a speaker's podium. Relax your eyes and neck during working.Rolling computer cart has 4 platforms to store monitor, laptop, keyboard, printer, CPU, PC tower and speakers. The height of top two shelves are optimized for ergonomic laptop/keyboard and monitor placement. Easy assembly and Flexible. Tilting desktop allows multiple angle requirements. Ledge on the bottom holds papers in place from sliding for a solid work environment while tilted. With 4 flexible 1.5 inch furniture casters, it is easy to move the desk from room to room ,and the desk locks into place with two locking brakes. If you have any questions about this product by ProHT, contact us by completing and submitting the form below. If you are looking for a specif part number, please include it with your message.